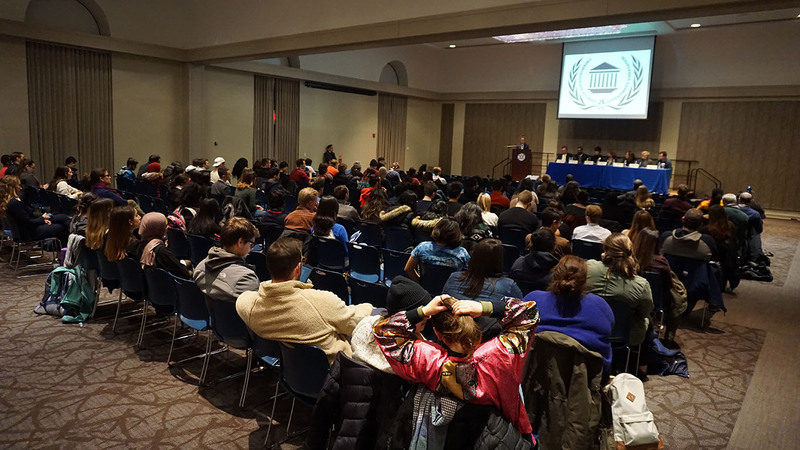 Few issues on campus ignite as much conversation as housing, and that’s why the Undergraduate Student Government Association held a town hall meeting Jan. 28 in the Behrakis Grand Hall to initiate dialogue between students and administrators involving student housing. 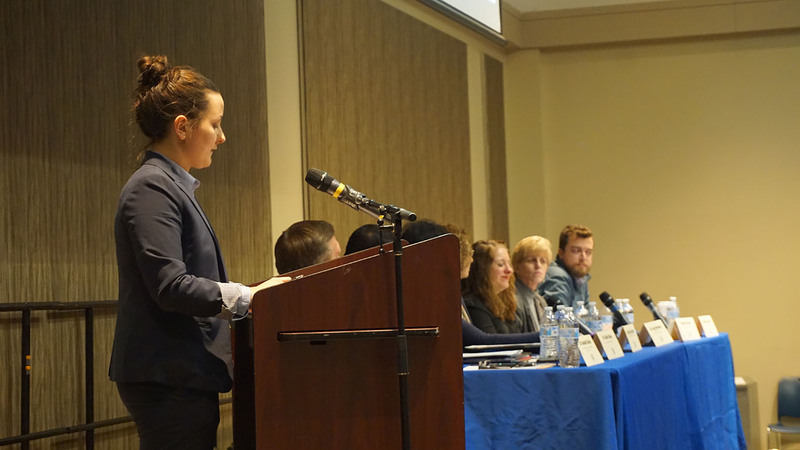 “We think it’s really important that you’re able to voice your concerns or opinions — especially regarding student housing,” USGA’s Student Body President Tamara Callanan stated in her opening remarks to almost 150 students who sat in the crowd, eager to share their comments. Before opening the floor to students, Callanan posed questions to an an open panel, which included Senior Vice President of Enrollment Management & Student Success Dr. Randall Deike; Vice President and Dean of Student Life Subir Sahu; Vice President of Public Safety Eileen Behr; Senior Vice Provost for University and Community Partnerships Lucy Kerman; Executive Director Residential Living and Student Conduct Melissa Depretto Behan; Executive Director Office of Financial Aid Cindy De Lone; and American Campus Communities’ Area Manager Matthew Mechlin. In the first hour, Callanan rattled off common concerns students have, directed to particular panel members. She first posed a question to Deike regarding how this year’s influx of freshman displaced 74 students. “I would choose a different word than displaced,” Deike contended, which evoked annoyed scoffs from many audience members. He then went on to explain the difficulty in artfully planning for a new class. Due to the unpredictability of the process, he said they must factor in a “safety valve,” which may result in over-committing based on what they see historically and if they do better than predicted. “Enrolling a class is not an exact science,” he continuously argued. One upset student in the crowd interrupted Deike to ask why freshmen were more important than sophomores, but Deike said that wasn’t the case and that displacement didn’t officially occur since he claimed that no signed contracts were involved. He reiterated that the University’s foremost goal is always to support students first, though he admitted this can be hard to balance with overall revenue targets. “We’re as much a business as we are an academic enterprise,” he said. But Sahu jumped in, speaking in a much more sympathetic tone, and explained how this miscalculation can serve as a learning experience for administration. “We take situations, and we try to learn from them and move forward,” Sahu said, adding that the renovation of Calhoun Hall will also help put more beds online for the upcoming year, which could begin to solve the problem. But Callanan then asked why the newest housing option right on Drexel’s campus — the luxurious Vue32 — cannot be leased to students. This, Deike said, is a response to what community members wanted: a high quality child care center and housing guaranteed separate from students. The spotlight was back on Sahu as the conversation switched to the university’s current 2-year residency program and the overall pricing of campus housing options. Sahu explained the importance of keeping students on campus for as long as possible. “A student is much more likely to have a higher level of engagement, retainment and be successful in and out of the classroom if they are living on campus,” he said, while also emphasizing how this increases safety for students as well. And when Callanan questioned the level of affordability of Drexel housing, Sahu discussed how housing rates have been relatively steady for the past several years, though he said that conversations have been ongoing to lower prices to further accommodate student needs. “This has been a big topic for us,” Sahu said. Another ongoing conversation that is unraveling, according to Behr, is patrol borders of the Drexel Police force. The current patrol area extends from 30th to 36th Streets and Chestnut to Spring Garden Streets, which goes slightly beyond where academic buildings and residence halls are located. 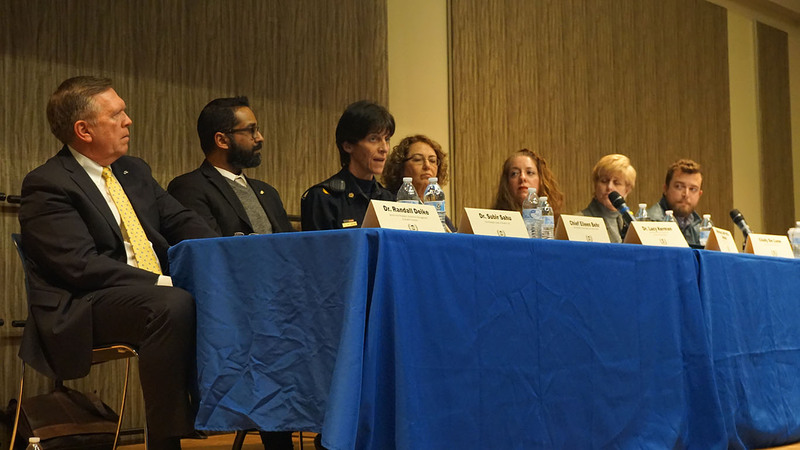 Though many students would like to see these borders extended, Behr reminded the audience that resources are limited since there are currently only 40 members of the force working 24 hours every single day. She did, however, give students advice on how to stay safe, especially when going beyond campus zones. “It’s a matter of being aware at all times,” she said, explaining how students should always look out for lights offered by community members. This was the perfect transition for Kerman to offer her community-oriented perspective to campus housing since Drexel rests between three vivid communities: Powelton Village, Mantua and West Powelton. She said a safe and exciting urban experience results in maintaining a positive civic structure and from getting to know your communities — and neighbors — in the right way. “In being a good neighbor, you should think about it as being as respectful as you would be and as you’d want people to be in your own home,” she said, joking about how students wouldn’t want others squashing red solo cups on their porches, tossing pizza crusts on their sidewalks or even urinating in their flower beds. After a quick discussion on guest policies and gender-inclusive housing, the focus turned to Mechlin as he explained how ACC properties are working to become more accommodating. He talked about the positive changes they’ve been enacting, like making the rising sophomore priority period to sign leases completely digital and crafting shortened leases for students on co-op, but in the following hour, students attacked many other ACC strategies when the floor was given to them. When the floor opened to the audience, hands shot up from all corners of the room. About a dozen students got to stand up and were given the opportunity to voice specific housing concerns, but almost all of these grievances revolved around ACC. The first student that stood up explained how she was experiencing major roommate issues but that she could not break her lease. As a result, she explained that she was paying for her room but living at home and commuting to avoid her roommate. “What am I supposed to be doing when I’m paying for a dorm I cannot use?” she posed to the panel, explaining how she has already been in touch with several ACC officials who all told her that the only hope was subletting — something that she has had no luck with. Mechlin owned the question and said they could chat offline about the specific situation to concoct a solution. He made the same promise to several other students as they brought up other ACC-specific issues, mostly in regard to the leasing process. Cierra Frantz, a freshman sitting right in the front row, also questioned the panel, and Mechlin specifically, as she explained an issue she shared with her friends as they attempted to sign a lease. She explained how the group of friends who she was planning on signing a lease with did not get their desired floor plan, which they listed as their first choice, when other groups they knew got that particular plan even though they listed it as their third choice. Since the floor plan opened up only on the last day of leasing, their options were exhausted. She directed this frustration to the panel, arguing that their actions contradict what they claim to be their mission. “I heard you all talk about how you care about students, that we matter to you. A lot of the actions that you all seem to be taking and focusing on Drexel as a business don’t come off to me — and everyone else that I talked to — as focusing on caring about us. A lot of people are extremely upset,” she said. Students in the audience roared in agreement like she was saying what everyone else was thinking. Her next words inspired even more supportive yells, and applause boomed throughout the room. 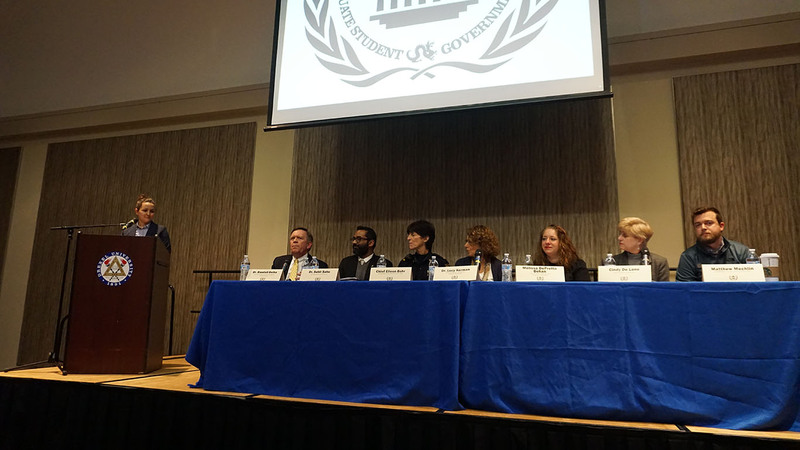 Though students were clearly in support of her, at the end of the two-hour event, she said she didn’t feel like her questions were answered by the panel. She found most of the responses throughout the night to be insincere and meaningless, but some students did find the town hall productive, however. And for USGA, it was a huge success. USGA holds public Joint Session meetings every Monday night from 7 to 9 p.m. where students can sit in and listen to what the organization is working on and bring individual feedback. Students with follow-up questions or inquiries from the Town Hall can email [email protected].